Hollywood actresses Felicity Huffman and Lori Loughlin made their first formal appearances Wednesday in Boston federal court along with ten other parents charged in the massive college entrance scandal in which prosecutors say they allegedly lied and bribed to get their children into elite schools across the country. While there was no red carpet, there were plenty of paparazzi photographers, news cameras and even fans there to greet them as they made their way in and out of U.S. District Court. In a camel-colored pantsuit, grey shirt and dark-rimmed eyeglasses, Loughlin, 54, smiled and waved at a group of fans as she and her husband, fashion designer Mossimo Giannulli, dressed in a dark suit and green tie, got out of a black van in front of the courthouse with their team of lawyers. 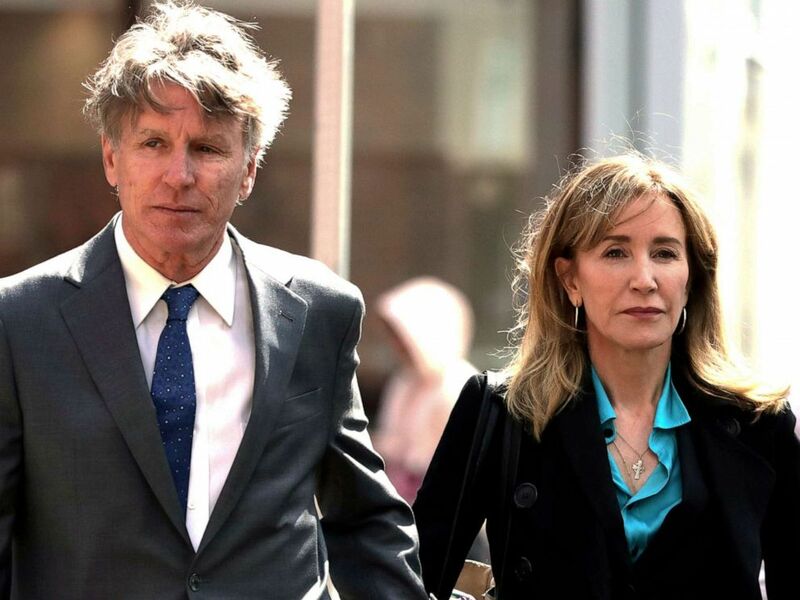 Felicity Huffman arrives holding hands with her brother Moore Huffman Jr., left, at federal court in Boston on Wednesday, April 3, 2019, to face charges in a nationwide college admissions bribery scandal. "Hi guys," Loughlin said to a group of fans, who yelled back, "We love you!" As she entered the courtroom, Loughlin shook hands with prosecutors before she and her husband, who is also charged in the case, took seats in front of Magistrate Judge M. Page Kelley. When her case was called, Loughlin and Giannulli listened as the charges of conspiracy to commit mail fraud and honest services mail fraud were formerly read against them. When asked by Kelley, if she understood the charges, Loughlin affirmed, "Yes, your honor." Loughlin and Giannulli left the court without entering pleas. They did not speak to reporters. Huffman, 56, wore a black pantsuit and emerald blouse as she sat in court with her brother. She also answered, “Yes, your honor,” when asked if she understood her rights and the charges of conspiracy to commit mail fraud and honest services mail fraud. Her husband, actor William H. Macy, who has not been charged in the federal probe, did not attend the hearing. Lori Loughlin, and husband Mossimo Giannulli facing charges in a nationwide college admissions cheating scheme, leave federal court in Boston, April 3, 2019. Huffman and Loughlin are the highest profile defendants indicted in the investigation dubbed by the feds as "Operation Varsity Blues." They are among 35 parents charged in the scam allegedly masterminded by William Singer, owner of a college counseling service and a sham charity called Key Worldwide Foundation. Singer allegedly accepted bribes totaling $25 million from parents between 2011 and 2018 "to guarantee their children's admission to elite schools," including Yale University, the University of Southern California, UCLA, Georgetown, Stanford, the University of Texas, Wake Forest and the University of San Diego, federal prosecutors said. Singer of Newport Beach, California, pleaded guilty in a Boston federal court last month to charges of racketeering conspiracy, money laundering conspiracy, conspiracy to defraud the United States and obstruction of justice. Loughlin and Giannulli “agreed to pay bribes totaling $500,000 in exchange for having their two daughters designated as recruits to the USC crew team -- despite the fact that they did not participate in crew -- thereby facilitating their admission to USC," according to the indictment unsealed on March 13. The couple allegedly submitted fake athletic profiles, including “action” photos of their daughters on rowing machines, the indictment alleges. They allegedly paid $50,000 to USC’s associate athletic director, Donna Heinel, to get her to “recruit” their oldest daughter Isabella as a coxswain. After Isabella was accepted, Giannulli allegedly wired another $200,000 to Singer’s bogus charity, the indictment alleges. Heinel pleaded not guilty to racketeering conspiracy last month and her attorney said she is looking forward to "reviewing the government's evidence and fully restoring Donna's reputation in the college athletic community." 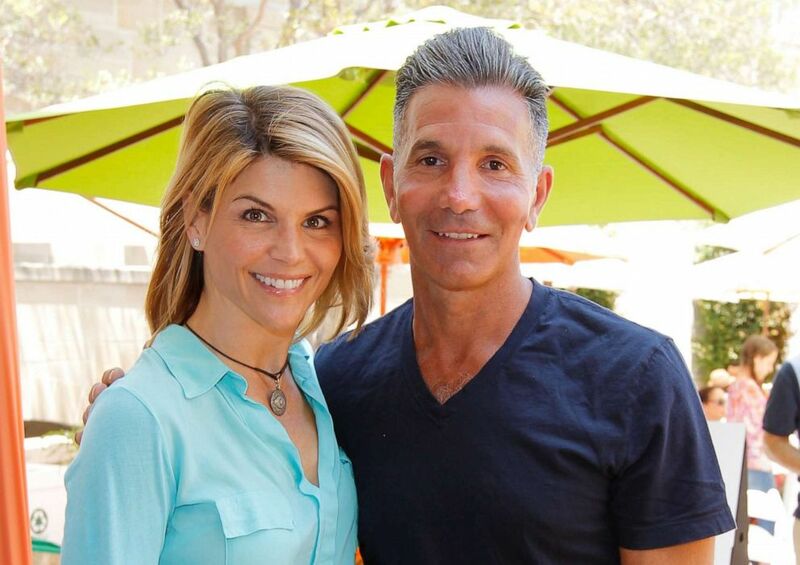 PHOTO:Lori Loughlin and Mossimo Giannulli attend the 6th Annual Kidstock Music And Arts Festival, June 3, 2012, in Beverly Hills, Calif.
Loughlin and Giannulli allegedly followed the same scheme for their youngest daughter, according to the indictment. That daughter goes by the name Olivia Jade, and was a social media influencer who before the scandal erupted had endorsement deals from companies like Sephora. Huffman -- famous for her Academy Award-nominated role in “Transamerica” and for playing one of the main characters in the television show “Desperate Housewives” -- allegedly gave $15,000 to Singer’s bogus charity "to participate in the college entrance exam cheating scheme on behalf of their oldest daughter," court documents allege. "Huffman later made arrangements to pursue the scheme a second time, for her younger daughter, before deciding not to do so," court documents allege. Also appearing in Boston federal court Wednesday was Gordon Caplan, who was put on leave from his job as co-chairman of the international law firm Willkie Farr & Gallagher when he was charged. He’s accused of paying $75,000 to rig his daughter’s ACT college entrance exam despite allegedly saying on a recorded phone call he “worried about the moral issue,” according to court documents. Manuel Henriquez, 55, who stepped down as CEO of a Northern California hedge fund, also appeared in court with his wife, Elizabeth, 56. The couple allegedly paid Singer to help their two daughters cheat on their standardized tests, according to the indictment. The couple also allegedly paid $400,000 to Singer’s charity to bribe Georgetown’s tennis coach Gordon Ernst to designate their older daughter as a tennis recruit. Ernst, 52, who is accused of accepting $2.7 million in bribes to designate at least 12 applicants as recruits to Georgetown, has pleaded not guilty. Also appearing in court were the latest parents to be charged in the case, Dr. Gregory Colburn and his wife, Amy. The Colburns both waived a formal reading of the indictment and pleaded not guilty to counts of mail and wire fraud, and conspiracy to commit money laundering. Amy Colburn stood with her hands clasped in front of her during the arraignment. The Colburns allegedly participated in the alleged college entrance cheating scheme on behalf of their son. The couple allegedly transferred stock worth $24,443.50 to Singer’s charity and wrote a check for $547.45, according to the indictment. In addition to the wire fraud charges facing the other parents, the Colburns were indicted on money laundering charges last week. 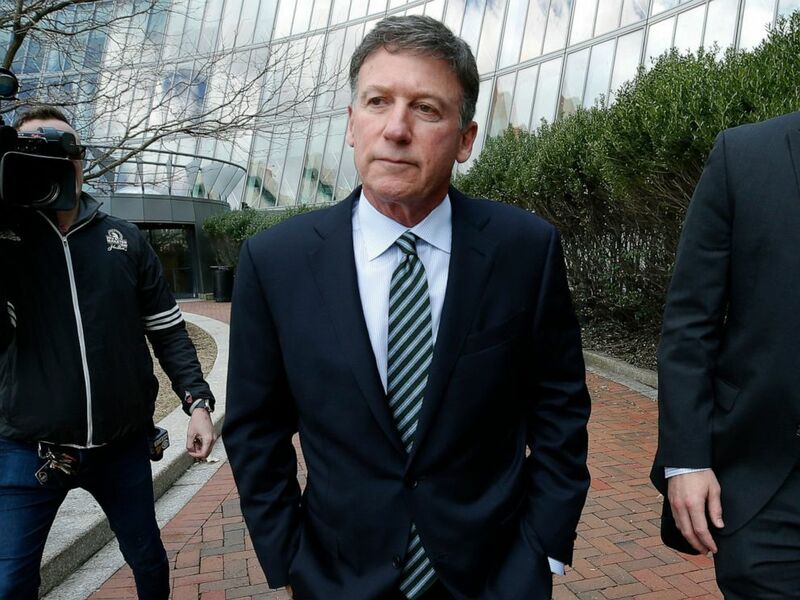 Bruce Isackson departs federal court in Boston on Wednesday, April 3, 2019, after facing charges in a nationwide college admissions bribery scandal. Bruce Isackson, 61, president of a real estate development firm in California, and his wife, Davina, 55; and Toby MacFarlane, 56, a former senior executive at a title insurance company, also appeared in court. Court documents allege that the Isacksons transferred 2,150 shares of Facebook stock -- with a value of about $251,249 at the time -- to Singer's bogus charity in an effort to get their daughter into college as a soccer recruit using falsified athletic profiles, according to court documents. Court documents allege that McFarlane paid thousands to get his daughter into USC as a soccer recruit and, later, gave $200,000 to Singer’s charity to get his son in as a basketball recruit. His daughter graduated from USC in 2018, but “did not play soccer at USC”, according to court documents. His son attended USC briefly but dropped out without ever playing basketball. Homayoun Zadeh, 57, a professor of dentistry at USC, also appeared in court. Zadeh is accused in court documents of having conspired to bribe Heinel, the former USC senior associate athletic director, "to designate his daughter as a lacrosse recruit -- despite the fact that she did not play lacrosse competitively -- thereby facilitating her admission to USC," court documents allege. Indicted parents Jane Buckingham, Peter Jan "P.J." Sartorio and John B. Wilson were initially scheduled to be in court on Wednesday, but their hearings were postponed until later this month. Sartorio's lawyer filed a motion to delay his hearing on grounds "that he intends to plead guilty." Sartorio, 53, of California, founder and CEO of a natural and organic food company, allegedly paid Singer $15,000 in cash in or about June 2017 to have somoene "correct" the answers to his daughter's ACT entrance exam, according to court records. ABC News' Meghan Keneally and Brian Hartman contributed to this report.